Each of Indiana’s state parks has something unique to offer and Spring Mill is no exception. Although currently encompassing over a thousand acres, the original 295 acres was purchased from a cement company for one dollar. Included in that purchase was a pioneer village dating back to the early 1800s, containing an 1817 spring-fed three-story gristmill, which still operates and provides corn-grinding demonstrations. The village consists of twenty historical structures, many of which can be accessed, including an original restored springhouse, tavern, and distillery. During certain times of the year, these buildings are staffed by heritage interpreters who portray the year 1863 and demonstrate period crafts. A pioneer of a different sort can also be found in the park. A memorial to Hoosier astronaut and Mitchell native Virgil “Gus” Grissom interprets the life of America’s second man in space. Exhibits at the memorial interpret Grissom’s life and career as a Mercury astronaut, and include artifacts like his space suit, the Gemini 3 “Molly Brown” spacecraft, and other artifacts from his personal and professional life. 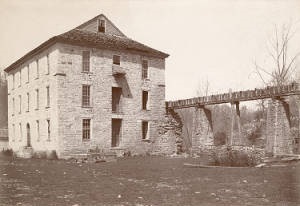 Indiana Division of Historic Preservation and Archaeology, “Spring Mill State Park,” Discover Indiana, accessed April 25, 2019, https://publichistory.iupui.edu/items/show/365.